Summit Queen Platform Bed in Natural Linen This classically styled beauty of a bed will be the centrepiece of any bedroom in the house, from the master to the guestroom. Fully upholstered headboard, footboard, and side rails provide a cozy look and the soft linen fabric completes the warm, inviting feel of this bed. The diamond-patterned stitching and button tufted headboard create a comfy backdrop and the sturdy bentwood slat support system provides full support without requiring a box spring. Coffee-finished solid wood feet pull the look together perfectly. 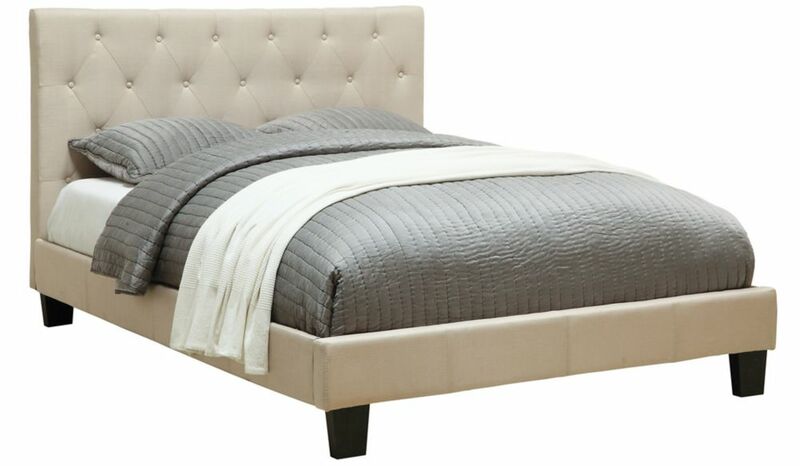 Summit Queen Platform Bed in Natural Linen is rated 3.8 out of 5 by 6. Rated 1 out of 5 by Melissa from Fell Apart! A gift from my mom a year ago, and in that time it has fallen apart! In 3 months the metal frame collapsed, then a couple of months later the VERY cheap wooden slats started to snap when sitting on the bed. I've called to see about getting it fixed, but was told I have to buy replacement parts... It's the most cheap wood put together into an expensive frame. Come see for yourself! Rated 4 out of 5 by Addie from Excellent product but instructions could be improv I purchased this a month ago and it is really a beautiful looking bed. My only complaint is the instructions said not to tighten the screws as you go along but you definately need to tighten the screws everywhere before putting the slats in place otherwise you have to re do the entire step of putting the slats in, so make sure to tighten them before the slats are added. Rated 5 out of 5 by Dwiggles from Tufted headboard queen bed I love this bed!! It looks very classy and the materials are good quality. Structurally strong, and I have even recommended it to other friends. No 'creaking' sounds when you move about, its just perfect. Rated 5 out of 5 by JacqW23 from Great Value & Looks Great I recently purchased this queen size bed in the linen and couldn't be happier with it. The bed was easy to put together (with two people). Note - follow the instructions and do not tightnen up the screws until the very end. If you are looking for a stylish bed, but don't want to break the bank - I would purchase this. Rated 3 out of 5 by JD from get what you pay for This bed is what you expect for the price. Only complaint is that the directions were not very descriptive. Is this equivalent to the bed Worldwide-Homefurnishings-Queen-Tufted-Linen-Platform-Bed-in-Natural-Linen? Is this a queen size? What is the weight limit for a queen size?